In Release 5.0 or above tally make lots of changes in their software. 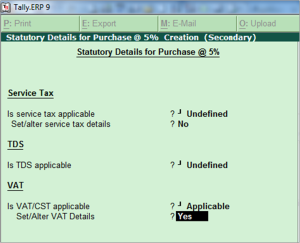 In this tutorials, we know about VAT Configuration in TallyERP.9 above release 5. We have a query on our facebook fan page for configuration of vat in Tally. For resolving this problem, we have to first configure our sales and purchase ledgers. In this case we have configure Purchase Ledger with Tax Rate @ 5%. 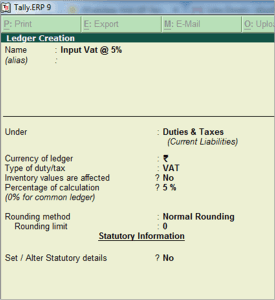 If you already have Purchase Ledger then alter this and select yes as Set / Alter Statutory Details. Following details appear on Screen. Select Purchase Taxable, Enter Vat Rate @ 5% and Tax Type Taxable. Now Purchase voucher is fully configured for your vat Computation. 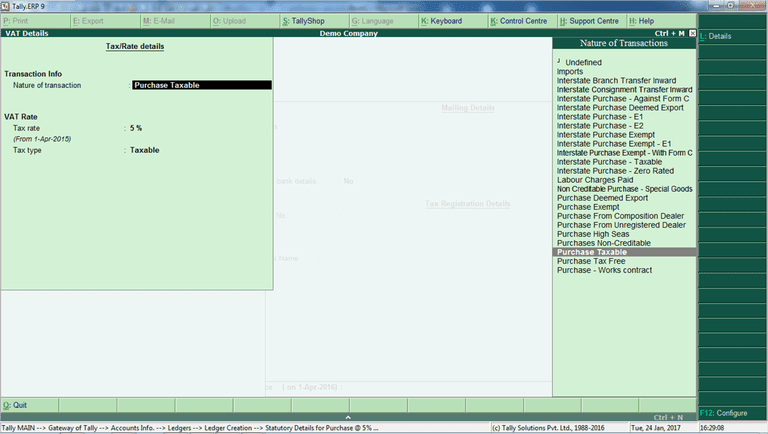 Now we configure Tax Ledger i.e. input vat @ 5%.